Say goodbye to summer with a quick gluten free quesadilla . Grab that basil growing in the garden and those delicious tomatoes before they are gone for the season. 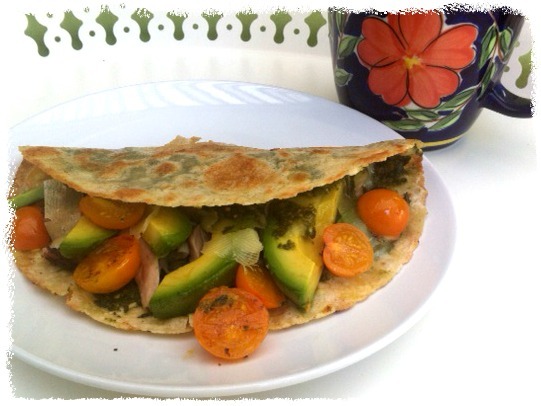 Make a pesto and add it to a tortilla with avocado and chicken and you have a meal! Oh and did I mention how great these are for game day when you want to watch the game and not be stuck in the kitchen! This was so delicious I had a hard time not making it every day. Well I did for a couple days in a row but who could blame me. I love pesto and the health benefits of basil makes it even sweeter. This is a great way to use up any cooked protein you have around and can be made start to finish in about 15 minutes. Now that helps with that easy healthy gluten free life. You can also keep this vegetarian and vegan by not adding in the chicken. Beans make a nice sub here. 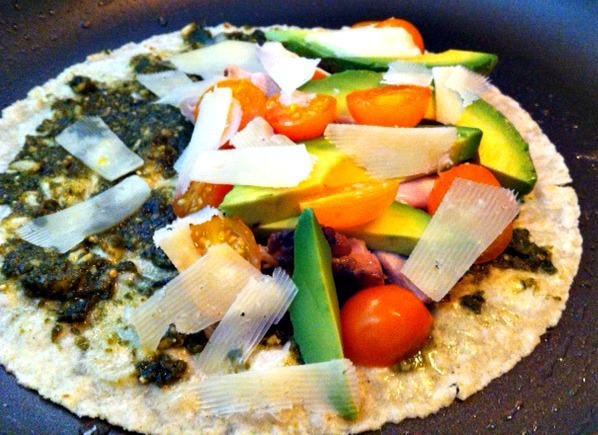 Spread a layer of pesto onto the tortilla. Sprinkle around the chicken, avocado, tomatoes and cheese. Place into a skillet heated on medium high with the coconut oil plain side down for 5-10 minutes until the cheese starts to melt. Fold half on top of itself to seal the two sides together with the melted cheese and heat for 3-5 minutes more. I think we both share an affinity for food that fit into tortillas. I could seriously live on wraps and the like. Great recipe. Love that you added pesto. Yes! It's amazing on anything (well, maybe not in chocolate chip cookies…then again…you never know). Hmmm, not on cookies- agreed. But I do love pesto. Do you mix up the greens or the nuts you use when you make pesto? Shirley I had to make these again after moving in. They are so fast but have to go slow on those wraps. Happy to make you one! OMG THAT LOOKS SO GOOD!!!!!!!!! I haven't had a quesadilla in over 5 years! I'm not much on packaged foods but having these tortillas in the freezer is nice for once in a while treat.